”To solve both of these challenges, enterprises should have control and visibility over their security throughout the cloud, and being able to enforce, develop and monitor security policies is key to ensuring an integrity,” Jason Hart, vice president and CTO of data protection at Gemalto said. “The cloud is storing all types of information from personally identifiable information to passwords to credit cards”. In today’s world, it’s an easy deal to get access to unauthorized data, the data can be of any kind, for eg – customer information, email, consumer data, employee records etc. All the data, is associated with some kind of risk value to itself. All the customers will ensure the usage of the right methods to attain high privacy of their data, once they identify the risk linked to the leak of the data,” he added. The beginning started off on a good note for leveraging the cloud, however the organizations were concerned about its security. “Having tracked the progress of cloud security over the years, when we say ‘confidence in the cloud is up,’ we mean that we’ve come a long way”. Security has always been a concern and continues to be”. “Security in the cloud can be improved if the security control is applied to the data itself.” Hart further added. To register for this webcast, or watch it on-demand click here. 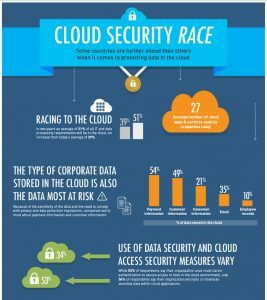 A new study on cloud data security provides insights into the shaken confidence in the cloud. Despite its increased use, payment and customer data still appears to be at risk. We’ve heard of the challenges of Amazon S3 Buckets and the exposure of customer data to the world wide web. When cloud storage technology emerged, the new technology had plenty of hype. Companies flocked to the new technology, and they started integrating it into their daily work structure. However, security was usually overlooked, limitations not put into place and nonessential employees given administrative access to make important changes to data. “Organizations are benefiting from the convenience that the cloud offers along with its scalability and controlled costs. Though these are great advantages, businesses shouldn’t lose sight of the security of the information they’re inputting into the cloud. Simply adopting cloud services does not guarantee that data will be secure as there are additional steps to be taken to do so. MUMBAI: While an overwhelming majority of global firms have adopted cloud services, there is still a wide gap in the level of security precautions applied by them, a survey has revealed. Almost half of Indian organisations say they are not likely to secure sensitive data in the cloud, according to the ‘2018 Global Cloud Data Security’ survey by global digital security firm Gemalto. “While it’s good to see some countries like Germany taking the issue of cloud security seriously, its a worrying in rest of the world. This may be down to nearly half believing the cloud makes it more difficult to protect data, when the opposite is true,” Gemalto CTO, Data Protection, Jason Hart said. Globally, organisations said only two-fifths of the data stored in the cloud is secured with encryption and key management solutions, it said. While an overwhelming majority of global firms have adopted cloud services, there is still a wide gap in the level of security precautions applied by them, a survey has revealed. The UK has fallen behind other countries in protecting assets stored in the cloud, according to a study conducted by digital security company Gemalto. The findings revealed regional discrepancies in adopting cloud security, with Germany the front-runner. Gemalto revealed that while the vast majority of global companies (95 percent) have adopted cloud services, there is a wide gap in the level of security precautions applied by companies in different markets. Organizations admitted that on average, only two-fifths (40 percent) of the data stored in the cloud is secured with encryption and key management solutions. “The benefit of the cloud is its convenience, scalability and cost control in offering options to businesses that they would not be able to access or afford on their own, particularly when it comes to security. However, while securing data is easier, there should never be an assumption that cloud adoption means information is automatically secure.